Cuddly couple of Glen Dochart hills...not! After yesterday's exploits on Beinn a'Chochuill/Eunaich I wanted to see if I could manage another couple today. Forecast was for some morning cloud, but it was raining quite heavily and dark in that miserable wintery way when I set off from Greenock at 6.50. 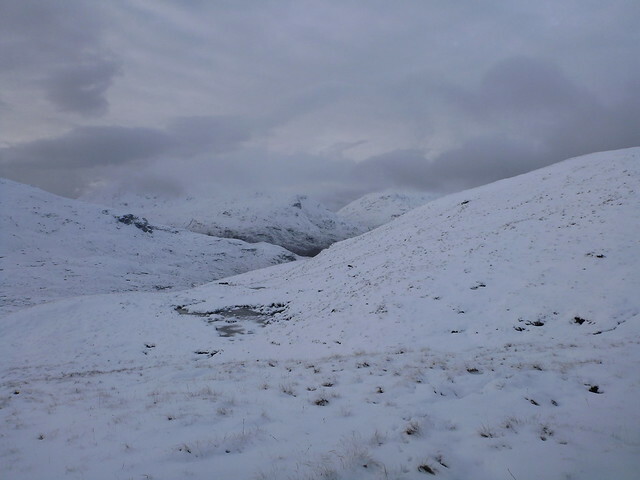 I wasn't looking forward to the day at all - I'd read the winter reports for these hills and they sounded pretty mean. I was on my own too, having left the dog at home cos I thought 2 days on the trot would be a bit much for him, and because I had read about having to go thru a farmyard at the start of the walk. Got up to Auchessan for 8 and parked on the A85 verge. Rain had slowed to a drizzle and it was looking quite bright, but I thought waterproof jacket was the choice for today. Felt better already as I headed past the houses and through the livestock area, mostly inquisitive sheep with a few loud hieland coos in the background. Dog would've been ok... The track is easy to follow, with boot signs every so often and follows the left side of the river. Was a bit boggy, but nothing terrible. 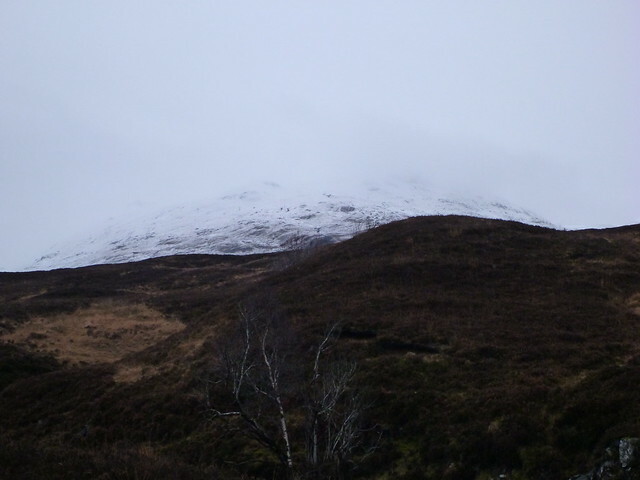 After maybe 3km I could finally see Sgiath Chuil looming white and ominous ahead. But I was feeling ok, legs not complaining (yet) and a nice peaceful traipse across the moorland. 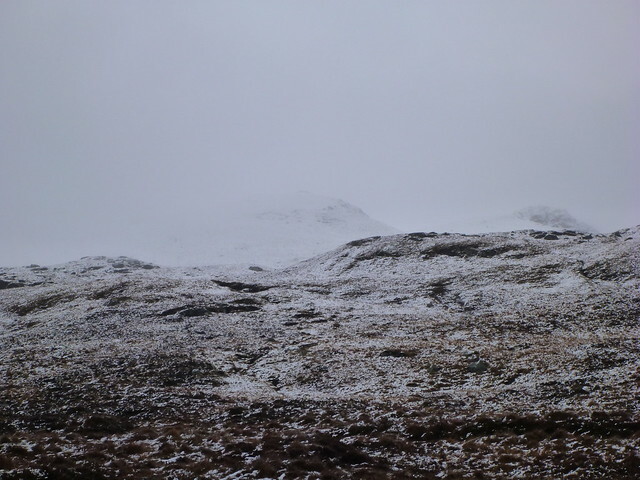 Path became invisible when the heather & snow started at about 650m. It had taken about 5km to get to the start of the hill. 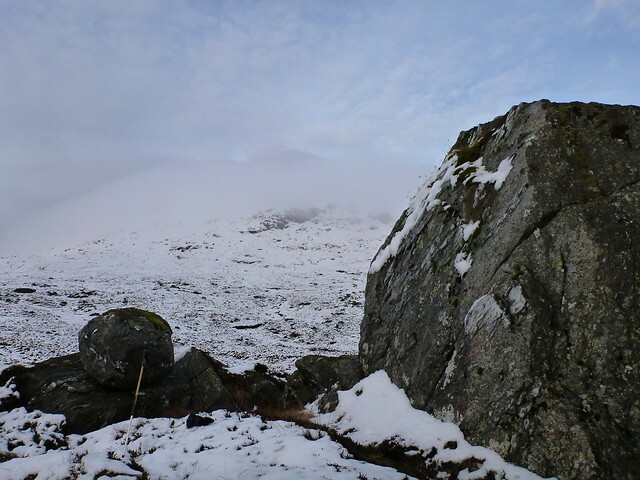 Snow was soft and wet and the incline modest, then reached the base of the steep section, which was deep in snow and took a while to get up - headed for a black outcrop of jutting stones. 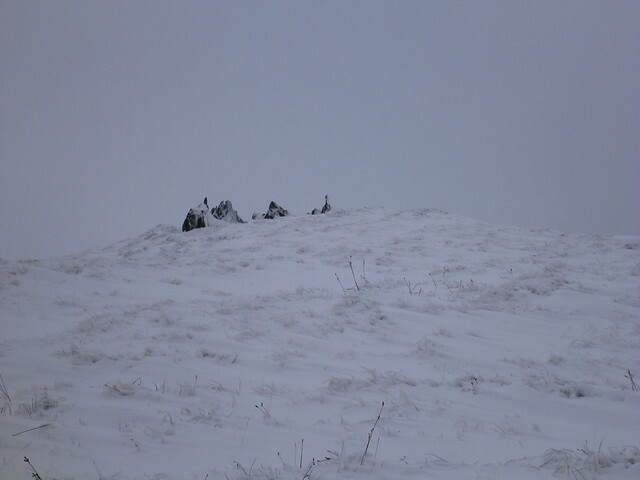 then headed north along the ridge before turning sharply west to descend another very steep snowy slope. 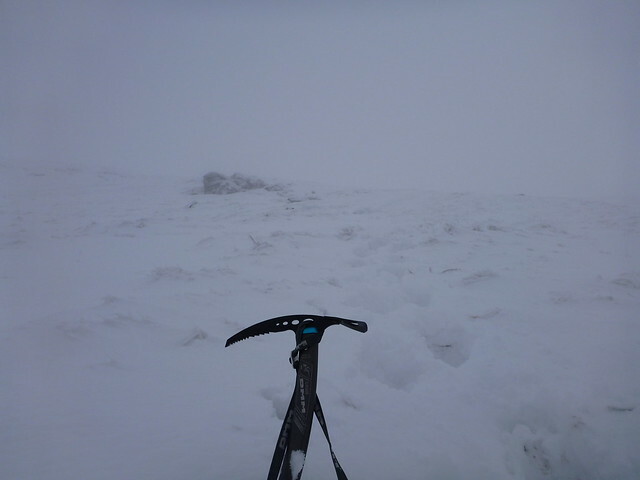 needed to take this slow too, with use of the ice axe - resisting the temptation to slide. 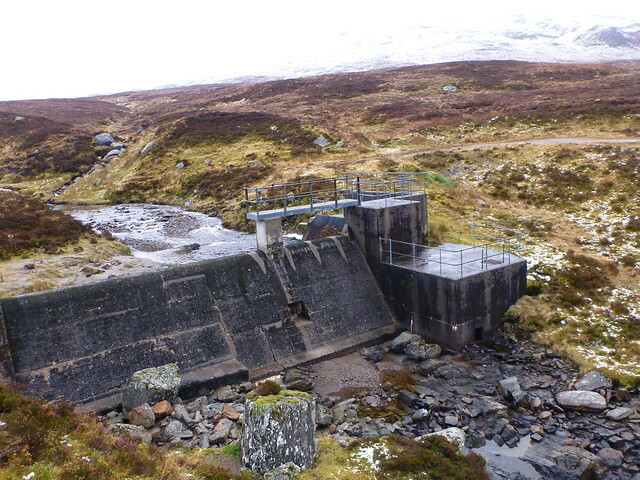 The walk over to Meall Glas was through heather and pools of bogwater which had coverings of slush and the desolation of the place reminded me of the Dead Marshes from Lord of the Rings. Not a soul about, no wildlife other than the occasional cry of a raven I couldn't see. 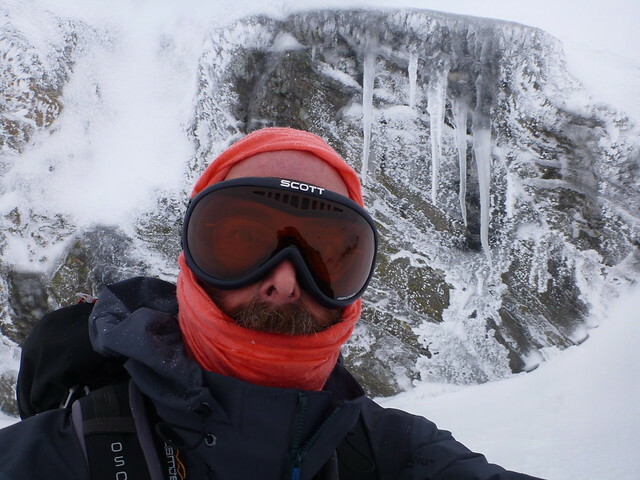 Eventually started ascending again - in places the snow was deeper than waist height where it had drifted and I had to go across a few bits on hands & knees to avoid sinking - that didn't stop the odd step into a hole under the snow. 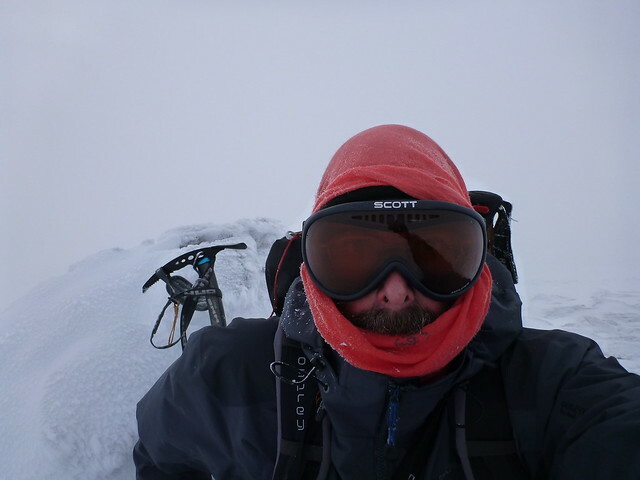 Quite difficult to find the right direction here, headed uphill towards Beinn Cheathaich though stopped on the top of a smaller rise where there was some shelter to have something to eat - needed a bit of energy boost after all the ups and downs. Headed up to the top of the ridge, which seemed easy enough, but was having problems with my Satmap, which was intermittently stopping showing my position/movement - despite having good satellite reception, apparently. Not had this problem with it before, and got a bit concerned, as there was very little to take a sighting from - the clag had come down again and everything was white. When I did finally get to the ridge top things were even worse - complete white out, I could literally see nothing. I knew there was a drop to the east side but by this time was somewhat disorientated and I got a bit scared. Mist lifted a little and I could see down the ridge, but because the track changes direction along the ridge I wasn't really sure where I was. 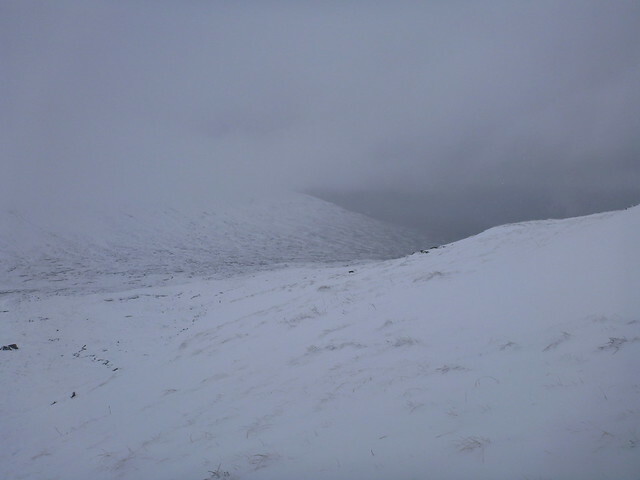 Anyway, didn't come to grief and the satmap started behaving itself again, so I made it up to the level area and trotted off to find the summit of Meall Glas. It's quite far away! Another bit of crap navigating had taken me a bit further south than the final path to the summit and it was a steeper final ascent than otherwise would have been the case. 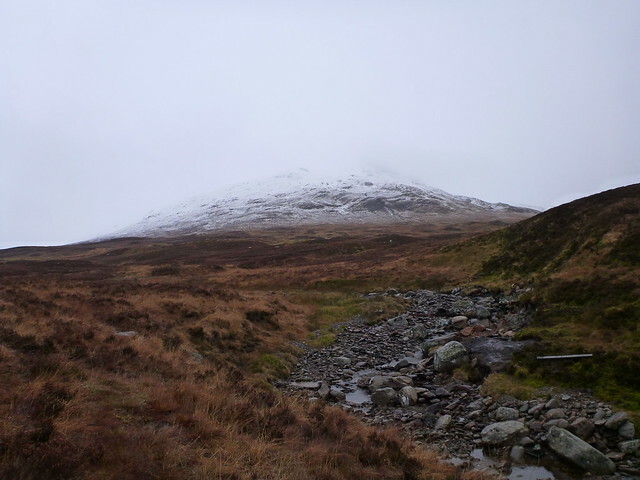 By this time I'm feeling a bit tired and thinking some of the harsh words on other walk blogs about Meall Glas were justified. Got to the top at last- can't think of a time I've been happier to see the top of a hill. Looking forward to getting back down now, had enough for one day. It's quite steep on the descent, but it was nice smooth snow and I did do a few bits of sliding on my bum - trying out stops with my axe for practice. 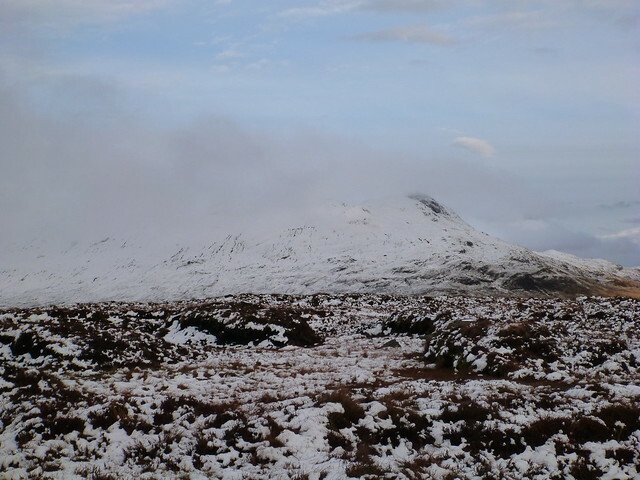 Briefly thought about going up Beinn nan Imrian which did look invitingly close, but decided I was mad enough already. Good job too as the way back was far longer than I was imagining it was going to be. 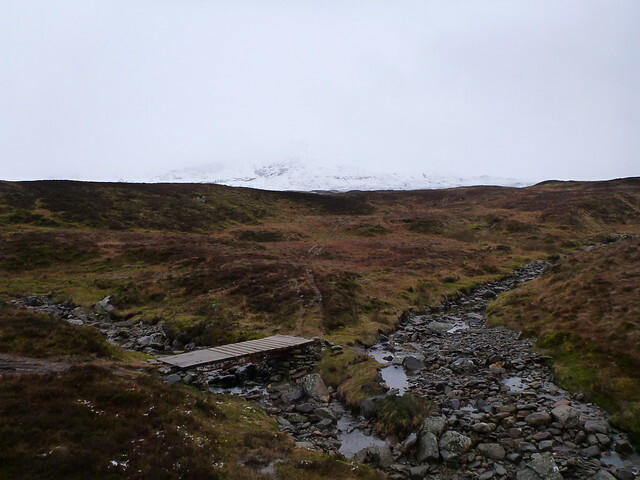 Heading over the featureless moorland in a mix of heather, bogs and snow was really quite hard - no evidence of a path and nothing much to head towards - needed constant checking of the satmap which got a bit tiresome. Found some big boulders and had a banana then continued on my weary way. 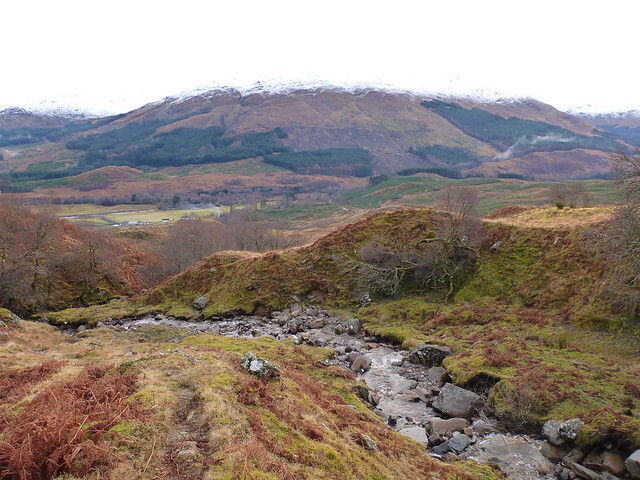 It wasn't until about 540m that the path became evident and it was much easier thereafter - following the wee river keeping it on my R and getting to the stile in the dip as mentioned in the walk outline. Still it took a good hour to get back to the starting point after I'd come out of the snow line, and by that time my back and legs were getting a bit sore .